When connecting between different versions of DB2, you generally need to bind packages from the different versions against the DB2 database. Just because you’ve bound db2ubind and db2cli on the server does not mean that all possible clients connecting in are covered. Sometimes binds happen implicitly, but sometimes they don’t. And you don’t necessarily want to grant a user rights to bind packages just because they’re going to need to do it once every 6 months when you apply a Fixpack or upgrade. It used to be that we didn’t have much choice in the matter – we had to get a client of the right version to bind from that client. But, luckily, in recent years, IBM has provided us with the files we need to perform binds for any version and Fixpack we may need. I had, of course, run binds for db2ubind, db2cli, db2schema, and an overall db2rbind just after the upgrade. 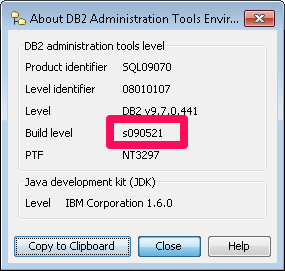 But this error clearly tells me that there’s something not bound – likely db2ubind. That translates to 9.7 Fixpack 0. I suggested the client be upgraded (preferably to 10.1, which is the server version), but also proceeded to get the bind files and bind them. Each of the files there contains directories for each fixpack. Note that in each directory name is the Build level that matches up to the value in the screen shot above – I can use that to understand which directory I need in this case. I think it is possible that if you have a special build, these numbers might not match up. Changing directories into fixpak00_s090521, I see the normal list of bind files like I would in $HOME/sqllib/bnd. It is then an easy matter to connect to the database and issue the bind command. I do get some fairly normal warnings. $ db2 "bind @db2ubind.lst blocking all grant public"
2239   SQL0204N  "SYSTEM.SYSUSERAUTH" is an undefined name. 2243   SQL0204N  "SYSTEM.SYSUSERAUTH" is an undefined name. SQL0595W  Isolation level "NC" has been escalated to "UR". 1173   SQL0204N  "SYSTOOLS.ADMINTASKS" is an undefined name. 1203   SQL0204N  "SYSTOOLS.ADMINTASKS" is an undefined name. 1234   SQL0204N  "SYSTOOLS.ADMINTASKS" is an undefined name. 1482   SQL0204N  "SYSTOOLS.ADMINTASKS" is an undefined name. 1499   SQL0204N  "SYSTOOLS.ADMINTASKS" is an undefined name. 1517   SQL0204N  "SYSTOOLS.ADMINTASKS" is an undefined name. 1555   SQL0204N  "SYSTOOLS.ADMINTASKS" is an undefined name. 1679   SQL0204N  "SYSTOOLS.ADMINTASKS" is an undefined name. 1696   SQL0204N  "SYSTOOLS.ADMINTASKS" is an undefined name. 1715   SQL0204N  "SYSTOOLS.ADMINTASKS" is an undefined name. 1732   SQL0204N  "SYSTOOLS.ADMINTASKS" is an undefined name. 1895   SQL0204N  "SYSTOOLS.ADMINTASKSTATUS" is an undefined name. 1950   SQL0204N  "SYSTOOLS.ADMINTASKSTATUS" is an undefined name. 1962   SQL0204N  "SYSTOOLS.ADMINTASKS" is an undefined name. 1979   SQL0204N  "SYSTOOLS.ADMINTASKSTATUS" is an undefined name. 342   SQL0204N  "SYSTOOLS.ADMIN_MOVE_TABLE" is an undefined name. 371   SQL0204N  "SYSTOOLS.ADMIN_MOVE_TABLE" is an undefined name. 455   SQL0204N  "SYSTOOLS.ADMIN_MOVE_TABLE" is an undefined name. 536   SQL0204N  "SYSTOOLS.ADMIN_MOVE_TABLE" is an undefined name. 570   SQL0204N  "SYSTOOLS.ADMIN_MOVE_TABLE" is an undefined name. 590   SQL0204N  "SYSTOOLS.ADMIN_MOVE_TABLE" is an undefined name. 671   SQL0204N  "SYSTOOLS.ADMIN_MOVE_TABLE" is an undefined name. 767   SQL0204N  "SYSTOOLS.ADMIN_MOVE_TABLE" is an undefined name. 903   SQL0204N  "SYSTOOLS.ADMIN_MOVE_TABLE" is an undefined name. SQL0091N  Binding was ended with "0" errors and "28"
Very fresh info: From windows client V10.5.5 to v9.7.10 linux database, regular bind won’t do the job . I had to add ” sqlerror continue” at the end of bind command. I’m just wondering: What if we use these IBM files and bind all packages from all versions as an step after applying fixpacks and migrations? This way it should proactively cover and avoid bind issue from any client version. Can anyone think about any capacity or performance impact by binding all packages? From last time I count it was 75 versions/FP’s. There is the overhead of performing the binds and the space that all of those packages take up. I have never heard of someone going that extreme with it. I don’t think it would have runtime consequences, but you’d want to test to be sure since it isn’t best practice or a normal practice.